By Clare B. Dunkle. New York: Henry Holt, 2005. Book Three of The Hollow Kingdom Trilogy. A folklore-based fantasy novel for young adults. "This great lord still has to work a spell tonight." The preoccupied elf lord began wandering toward the edge of the truce circle. Miranda walked with him, interested in the thought of the magic. "What is the spell for?" she asked, stepping close beside him to squeeze through the first ring of trees. "Do you really want to know?" murmured the elf absently, looking up at the dark crowns of the ancient oaks. "Yes," she answered. She had always liked magic. He glanced back down at her then. "It's for you," he said. And the instant they passed the great trunks, his hand closed over her wrist. Miranda has waited her whole life to come to the goblin kingdom. Now she's finally underground where she has always wanted to be, but she never imagined she would feel so lost. Her beloved Marak, the center of her world since childhood, has reached the end of his reign. But Marak didn't raise a coward. He taught Miranda to be brave, intelligent, and proud—the ideal woman to take her place beside Catspaw, the new goblin King. Then a mysterious and highly magical elf lord brings his people back to their homeland, reigniting the age-old battle between goblins and elves. Miranda finds herself a prisoner. Caught between the two hostile rulers, she becomes their greatest reason for war—and possibly their only hope for a future. Buy IN THE COILS OF THE SNAKE in paperback. 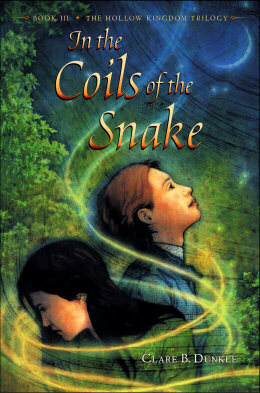 Buy IN THE COILS OF THE SNAKE in Kindle edition. A 2006 VOYA Best Fantasy book. "...This satisfying conclusion to the Hollow Kingdom trilogy more closely examines relations between the tough, practical goblins and the sensitive, graceful elves, the two magical races dwelling in Dunkle's Victorian England. ... Followers of the series will revel in this (evidently) final opportunity to lose themselves in Dunkle's distinctive, intriguingly disquieting vision." A Bank Street College of Education Best Children's Book. "... Book Three explores the history and racism of the goblins and elves in a compelling manner. The reader gets a full sense of the new characters and their struggles as well as the origins of hate between the goblins and the elves. Dunkle examines all sides, and the reader is exposed to both the beauty and ugliness of elf and goblin. This book is best read as the last in the trilogy, but it is as exciting and fascinating as the first installment." CLICK HERE FOR A HIGH-RESOLUTION BOOK JACKET IMAGE. Jacket art copyright 2004 by Matt Manley. Jacket design by Amy Manzo Toth. Book excerpt may or may not appear on printed book jackets. Excerpt copyright 2004 by Clare B. Dunkle. Text and image courtesy of Henry Holt & Co.